We look forward to meeting with our customers and partners. Details on our office, including hours, location, directions, and parking, are listed below. 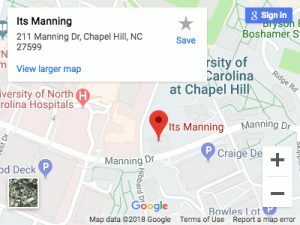 ITS Manning is a red and tan five story brick building located at 211 Manning Drive, on the corner of Manning and Emergency Room Drive in Chapel Hill, NC. Our office is located on the third floor, Room 3100. Our studio is next door in Room 3200. The hours of operation are from 8 a.m. to 5 p.m. Monday through Friday. 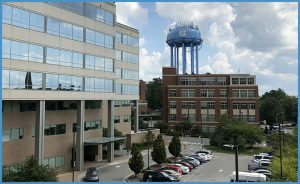 Take NC 86 South (which becomes Dr. Martin Luther King Boulevard) to downtown Chapel Hill. Take I-40 West to exit # 273A. Take NC 54 West to Chapel Hill. Take US 15-1501 North to Chapel Hill. US 15-501 will become South Columbia Street at the NC 54 intersection.